Cubism is a 20th Century Avant-garde Art Movement. Trường Phái Lập-Thể là một bước tiến đi trước trong lãnh vực Hội-họa ở Âu-châu vào khoảng đầu Thế-kỷ 20. Georges Braque (13 May 1882 – 31 August 1963), was a major French painter. Musée National d'Art Moderne, Paris, France. Last edited by BelleNuit on Thu Mar 29, 2012 8:02 am, edited 3 times in total. Last edited by BelleNuit on Thu Mar 29, 2012 8:01 am, edited 1 time in total. 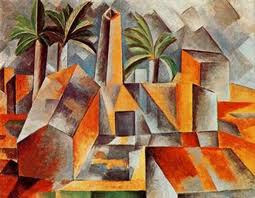 The period from 1910 to 1912 is referred to as Analytical Cubism. Paintings executed during this period showed the breaking down, or analysis, of form. Right-angle and straight-line construction were favoured, though occasionally some areas of the painting appeared sculptural, as in Picasso's "Girl with a Mandolin" (1910). Chủ nghĩa lập thể do Georges Braque và Pablo Picasso khởi xướng năm 1906 tại khu Montmartre của kinh đô ánh sáng Paris, Pháp. Họ gặp nhau năm 1907 và làm việc cùng nhau cho đến năm 1914 khi Đệ nhất thế chiến bắt đầu. Lập thể ảnh hưởng tới các nghệ sỹ vào thập niên 1910 và khơi dậy một vài trường phái nghệ thuật mới như chủ nghĩa vị lai, chủ nghĩa cấu trúc và chủ nghĩa biểu hiện. 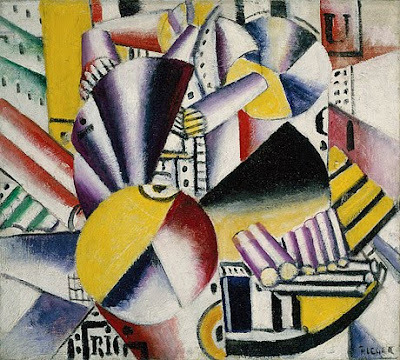 Cubism was one of the most influential visual art styles of the early twentieth century. It was created by Pablo Picasso (Spanish, 1881–1973) and Georges Braque (French, 1882–1963) in Paris between 1907 and 1914. 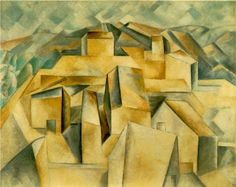 The French art critic Louis Vauxcelles coined the term Cubism after seeing the landscapes Braque had painted in 1908 at L'Estaque in emulation of Cézanne. Vauxcelles called the geometric forms in the highly abstracted works "cubes." Other influences on early Cubism have been linked to Primitivism and non-Western sources. The stylization and distortion of Picasso's ground-breaking Les Demoiselles d'Avignon (Museum of Modern Art, New York), painted in 1907, came from African art. Picasso had first seen African art when, in May or June 1907, he visited the ethnographic museum in the Palais du Trocadéro in Paris. In Cubist work up to 1910, the subject of a picture was usually discernible. Although figures and objects were dissected or "analyzed" into a multitude of small facets, these were then reassembled, after a fashion, to evoke those same figures or objects. 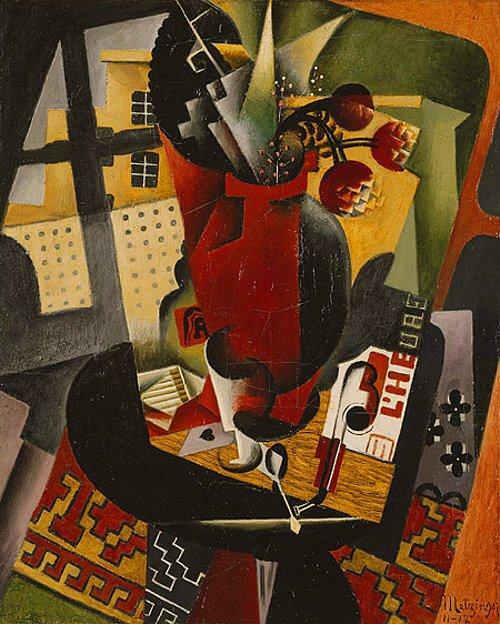 During "high" Analytic Cubism (1910–12), also called "hermetic," Picasso and Braque so abstracted their works that they were reduced to just a series of overlapping planes and facets mostly in near-monochromatic browns, grays, or blacks. In their work from this period, Picasso and Braque frequently combined representational motifs with letters (1999.363.63; 1999.363.11). 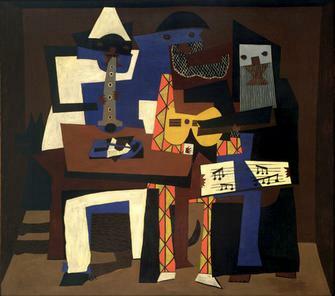 Their favorite motifs were still lifes with musical instruments, bottles, pitchers, glasses, newspapers, playing cards (1997.149.12), and the human face and figure. Landscapes were rare. During the winter of 1912–13, Picasso executed a great number of papiers collés (1999.363.64). With this new technique of pasting colored or printed pieces of paper in their compositions, Picasso and Braque swept away the last vestiges of three-dimensional space (illusionism) that still remained in their "high" Analytic work. Whereas, in Analytic Cubism, the small facets of a dissected or "analyzed" object are reassembled to evoke that same object, in the shallow space of Synthetic Cubism—initiated by the papiers collés–large pieces of neutral or colored paper themselves allude to a particular object, either because they are often cut out in the desired shape or else sometimes bear a graphic element that clarifies the association.